Syria - more violence at the hands of "the reformer"
Hundreds of Syrian demonstrators have been killed by Syrian security and military forces on the orders of President Bashar al-Asad. This is in sharp contrast to the actions of the Tunisian, Egyptian and Yemeni armies which refused to fire on their own people. Syria is different, it always has been. It is ruled by a dictator with no concern for anything other than the perpetuation of his own regime, a man willing to use overwhelming violence to achieve that aim. Regardless of how Secretary of State Hillary Clinton characterized al-Asad as a "reformer," he's nothing of the kind. Oh, please spare me the drivel that she was only quoting visiting American legislators, that "many of the members of Congress of both parties who have gone to Syria in recent months have said they believe he’s a reformer.” If Mrs. Clinton cited the words, she believed them and owns them. The "reformer" image was something that Bashar cultivated as a promise to the people of Syria when he assumed power upon his father's death in 2000. It was not an easy feat, but his father had paved the way well. When the father dies, Bashar was not yet of age, but it only took the Syrian majlis al-sha'ab (legislature) about 90 minutes to change the constitution to allow him to serve. He came into power on a wave of hope that this young doctor, a technocrat, would move Syria into the modern world and be less restrictive than his father. The hopes were short-lived. The younger Asad proved himself to be capable of all the negative attributes of his father. It was not long before he revamped the pervasive and overlapping Syrian internal security services and intelligence organizations into a newer, more modern regime-protection system. He replaced all of his father's cronies with his own - younger, better educated and more capable. Yet, for whatever reason, he was able to maintain a facade of hope and change (pun intended). He married a cosmopolitan Syrian woman who had grown up, been educated and had worked in England. They became Syria's "royal couple." The Asads fit in well with that segment of Syrian society that has profited from the reign of the Ba'th Party. This group includes a mixture of the 'Alawite, Christian and Druze minorities and those Sunni Muslims who have allied themselves with the regime. On the other side is the specter of Islamic fundamentalism. It is the fear of turning into an Islamic republic like Iran that allies many groups with the Ba'th Party. That is ironic (or Iran-ic) since the Islamic Republic Iran is Syria's closest ally. "It is fine in Damascus, but there is some trouble in Homs, Latakia and Baniyas. Most of the people do not want problems in the country - what you see on television is much more exaggerated than the reality. It is hard for someone not here to understand what is really going on - no one is looking for trouble, perhaps maybe only 10 percent are causing the problems. "I do not deny that we need to have some changes, but certainly it is not worth bloodshed and killing. We all know that our president is working towards that change - we love him and his wife. "I cannot imagine the ikhwan (Muslim Brotherhood) in my country. We used to live in peace and that is all we want." He then referred me to several Facebook pages and websites. I checked them out. They are nothing more than outright pro-regime propaganda. There are other sources of information, mostly being smuggled out of the country at great risk. If you have the stomach for it, here is what is really happening in Syria's cities. WARNING - This is grisly, graphic material. Is this the action of a "reformer?" In the context of providing assistance to an armed opposition, there is really no such thing as "non-lethal" aid. Money is a fungible commodity, impossible to trace. If you provide money to a group with restrictions on how it can be spent, they will simply use your money for the purpose you have specified. They will then divert their own funds for weapons or things you have proscribed. If you provide them actual materiel, such as the Administration proposes, they will not have to procure those items with their own resources, freeing those funds to be used for weapons. This is "diplo-speak." The Administration can claim it has not given weapons to the Libyan opposition. That said, all of the items will obviously support military operations. Does it then matter? The Administration's memorandum justifies the aid as part of "efforts to protect civilians and civilian-populated areas under threat of attack in Libya.” Portraying the proposed assistance package as humanitarian aid is disingenuous. Let's be up front and state that we are supporting the opposition. The materiel we are providing will be used by the opposition forces in combat against the pro-government forces. In essence, we're providing everything but the weapons. Again, "diplo-speak." Efforts to protect citizens is merely a euphemism for providing support to opposition fighters. Our allies are a bit more open, refreshingly so. The United Kingdom has announced that it will send military officers to train and advise opposition forces, including coordinating NATO air strikes. The European Union agreed to deploy an armed force to protect deliveries of humanitarian aid. I fully support these efforts, but we must be aware of the "slippery slope" we have seen in other areas - Somalia comes to mind. 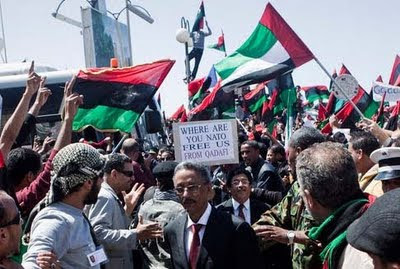 President Obama has repeatedly said that it is U.S. foreign policy that Libyan leader Mu'amar al-Qadhafi must step down. Recently, he has made the seemingly contradictory statement that the United States does not support regime change in Libya. Which is it, Mr. President? Make no mistake about it. 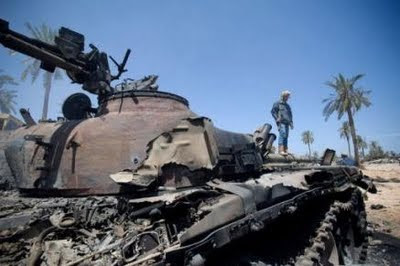 The only way Qadhafi will step down is via regime change, and it appears that violent removal is the only viable option. One of President Obama's favorite and often used phrases is, "Let me be clear." Okay, here's an opportunity to be clear, a chance to clear up the confusion caused by hiding behind words and trite phrases. There. Clear, concise and reflects the actual situation. Most Americans will support these efforts when you are honest about what we are trying to accomplish. Using "diplo-speak" and "politi-babble" only makes you look unwilling to stand up for the effort to which you have committed our resources. People read $25 million - they want to know what it is for. You have the chance to look like a real leader here. Go for it. I think the Muslim brotherhood is playing it smart this time. They did that in Egypt. They claimed they would not participate in the January 25 "revolution," and preferred to remain invisible until the 28th when they saw signs of success. Only then did they say they were "participating." It was their militia that fought back in Tahrir square in what is now known as the "Camel battle" when pro-government elements clashed with anti-government demonstrators. After Mubarak's fall, Essam El Arian of the Muslim Brotherhood said in a TV interview, "The revolution is a byproduct of the Brotherhood." We have to take this claim seriously, especially given what is happening on the ground in Egypt now. Egypt is turning into a more extreme right wing Islamic society. Mubarak was able to keep the ikhwan in check with a small window of operation. He also used the Salafis to his favor. Both groups are now on the loose. They feel like they have the law in their hands and can apply whatever backward thinking rules they want. Egypt is going downhill. I'm afraid it's too late to stop the Brotherhood from taking over. I think the United States should think carefully before arming any rebels, lest these same weapons be used against the U.S. and its interests in the region in the future. Islamic elements are playing a major role in all these uprisings - in Yemen, Libya, Jordan, Syria as well as Egypt. They played it smart in Egypt by hiding behind some "secular" figures at the beginning. Where are these figures now? Completely gone, and we are left to deal with the forces of darkness. 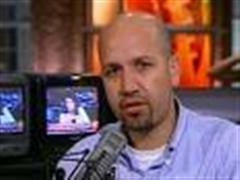 Rick - Excellent analysis of the situation in Libya, however, I think deploying ground forces will end the game in favor of Islamists. Dr. Jacob Keryakes is an Egyptian Coptic Chrisitian who provides his language and analytical skills to the NBC family of networks. He is also a personal friend. Syrian President Bashar al-Asad said Saturday (April 16) that he expects the government to lift the state of emergency that has been in effect for nearly 50 years. This is but one of the demands of demonstrators emboldened by successful regime changes in Tunisia and Egypt, continuing demonstrations in Bahrain, Yemen and Jordan, not to mention a civil war in Libya. I have to laugh at his choice of words about "expecting the government to...." In Syria, Bashar al-Asad IS the government. He alone can and will make the decision whether or not the state of emergency is ended. Of course, there will be show debates and a vote in the People's Council (the Syrian legislature), but in the end, it is Asad who decides what happens. What is more important and of concern, however, is the remainder of President Asad's statement. He continued that after the lifting of the emergency laws and the implementation of some reforms, there would no longer be any reason or excuse for demonstrations. 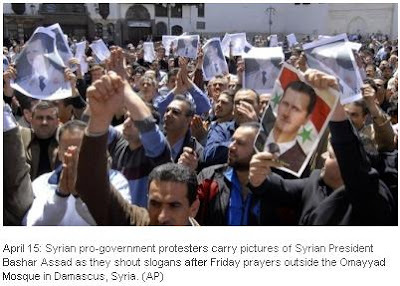 The Syrian leadership and media are careful to use the Arabic word for demonstrations rather than the word for protests. He stated, "After that we will not tolerate any attempt at sabotage." These are pretty clear words - this is a blatant threat. Threats from the Syrian government are not to be taken lightly. By now, the world is aware of the 1982 destruction of the city of Hamah when the Muslim Brotherhood defied the government; as many as 25,000 Syrians were killed in the artillery barrages that destroyed the center of the once-beautiful city. In the last month, over 200 people have been killed by Syrian security and military forces. In his remarks, Asad reiterated the claim that the demonstrations have been orchestrated by unidentified foreign conspirators who have incited armed gangs to attack security forces and Syrian civilians. In Asad's mythical version of events, Syrian security and military forces are merely acting to protect the population. I don't think the world is buying it. It will be interesting to watch. I lived in Damascus in the early to mid-1990's. The Syrian intelligence and internal security forces were and remain pervasive and heavy-handed. Their primary, possibly only, mission is to preserve the regime. Bashar al-Asad will do whatever it takes to remain in power. He may go through the motions of lifting the state of emergency and implement some reforms on paper, but nothing will really change. This is not Tunisia, this is not Egypt. When and if there is a serious threat to Asad's hold on power, he will use armed force to brutally put down the demonstrations. 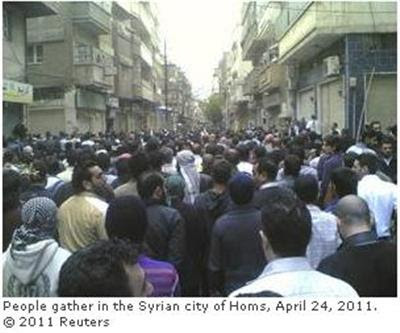 Although there were a lot of people willing to march in Tunis and Cairo, Damascus is different. The government has so thoroughly ferreted out any opposition groups that I doubt there are enough Syrians willing to risk their lives taking to the streets that will pose a real threat to the government. That said, I have been surprised at the number of Syrians willing to demonstrate. They are all aware of what we call "The Hamah Rules." I do not think Asad is going to put up with much more. His words were chilling, "We will not tolerate...." He means it. 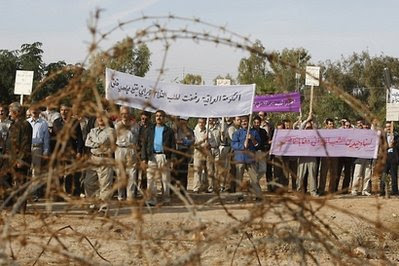 In yet another indication of Iran's significant and growing influence over events in Iraq, the government of Prime Minister Nuri al-Maliki ordered that the Iranian mujahidin-e khalq (MEK, also known as the People's Mujahidin of Iran, PMOI) opposition group resident at a former military facility, Camp Ashraf, leave the country. At least al-Maliki did not give in to demands from Tehran to repatriate group's members to Iran where most of them would likely face the death penalty. Since the U.S. invasion, which I supported, and the U.S. government's abysmal conduct, which I criticized, of the aftermath of the removal of Saddam Husayn, Iran has emerged as the primary power broker in the country. Iran's position as power broker was underscored by the recent formation of an Iraqi coalition government of the Shi'a and the Kurds. These two groups were able to thwart the will of the Iraqi electorate who cast more ballots for secular candidate and former prime minister Iyad 'Alawi, but 'Alawi was never able to form a government thanks to the maneuverings of Nuri al-Maliki, of course backed by Iran. Nuri al-Maliki is widely regarded as an Iranian stooge; I am in that camp. Many Iraqis refer to him as nuri al-irani, "Nuri the Iranian," and to his office as qali irani, "the Persian rug." To many of us, it appears that he receives his marching orders from Tehran. The decision to expel the MEK from Iraq certainly originated there, and I am willing to bet that the recent deadly attack on Camp Ashraf was not solely al-Maliki's idea. According to the MEK, 34 of its members were killed and over 200 wounded. Then the Iraqis delayed the entrance of American military medical teams to assist the wounded. You might be tempted to ask, "Just who is in charge?" Unfortunately, the Obama Administration apparently ceded that role to the Iranians. That is what happens when you pursue a policy of established withdrawal dates and a rush to the exit regardless of the situation on the ground. Pull out your troops without an accurate assessment of the security situation and say good bye to influence over events in one of the most important countries in the region. The best the Administration could do is to "urge Iraqi officials at the highest levels to avoid violence and show restraint." Not surprisingly, the Iranian regime of Mahmoud Ahmadinejad praised the Iraqi raid on the MEK camp. The Iranians have jailed or executed many members of the group in the past, and will not hesitate to do so in the future. The question is where will the group, mostly ethnic Persians, go? The group has been useful to the United States in the past, and could be again. The MEK/PMOI were key to uncovering Iran's nuclear program; much of the initial intelligence was gathered by MEK sources inside Iran. 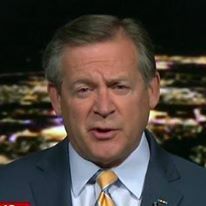 They have access that can be of use to the United States should the Obama Administration push for regime change in Iran. The MEK has an established, and apparently effective intelligence network inside Iran, and have shown the willingness to conduct lethal operations against regime targets. Iran has an abysmal record on human rights, has American blood on its hands in Iraq and Afghanistan, and is developing a nuclear weapons capability. Perhaps we should be utilizing the MEK to effect some - as Obama said during the campaign - "change we can believe in." 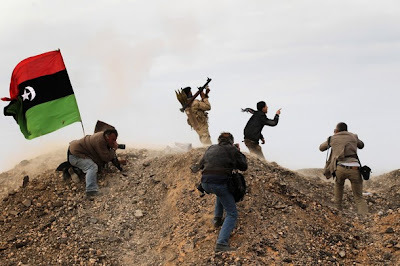 It has been two and a half weeks since the United States and a coalition began military operations in Libya to enforce United Nations Security Council Resolution 1973. That resolution authorized all measures to enforce a no-fly zone over the country and protect civilians from the violence in the country. The impetus for that action was the imminent defeat of opposition forces in Benghazi. First, a comment on the timing of the military action. It was a last minute rescue of the opposition. 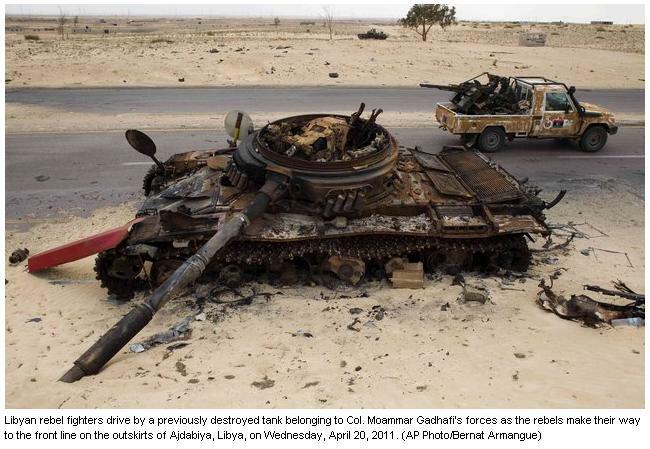 Had coalition aircraft and missiles not been committed to the battle on March 19, Mu'amar al-Qadhafi's tanks and infantry, supported by artillery and helicopter gunships, would have entered Benghazi and wreaked havoc on the surviving opposition fighters. Additionally, there may have been thousands of casualties among civilians either caught in the crossfire, or deliberately slaughtered by Qadhafi's forces to send a message to those who would oppose his regime. If America and its allies had not acted on that Saturday, Benghazi could have become Libya's Hamah, and the "Hamah Rules" could have been rewritten as the "Benghazi Rules." I refer to the incident in Syria in 1982 when a group of Islamic fundamentalists attempted to defy the authoritarian government of then-President Hafiz al-Asad (father of the current president). Asad deployed elements of the Syrian army under the command of his ruthless brother Rifa't. Syrian artillery flattened the center of the city and killed upwards of 25,000 people. The Syrian response has become notorious around the world as the Hamah Rules. Fortunately, the coalition responded on March 19 - and unfortunately the coalition responded on March 19. If there had been decisive American leadership when the rebels were on the move towards Tripoli and a no-fly zone imposed then, I might not be writing this article about the abdication of American leadership. Instead, we might be discussing the possibilities of a post-Qadhafi Libya. President Obama is to be commended for committing American military forces to the enforcement of the no-fly zone and protection of Libyan civilians. He is not to be commended for taking so long to make the decision. Hundreds, possibly thousands of Libyans died in the interim. It goes beyond that, however. It appears the President waited for the United Nations resolution and the agreement of European and at least two Arab allies. That in itself is not a bad thing, but it also appeared to be a further abdication of American leadership. Whether the President likes it or not, the United States is a superpower, a superpower with global interests and global commitments. Whether we like it or not, the world looks to us for leadership in times of crises. I understand the President's reticence to order American forces to attack an Arab or Muslim countries, given our past record in Iraq and Afghanistan, and earlier operations in other places in the Arab and Muslim worlds. Again, in and of itself not a bad thing. Reticence before placing young American men and women in harm's way is a good thing, however, timidity in the face of adversity is not. This was one case, maybe the only one we'll see for years to come, in which there was Arab sanction for military action. It was the Arab League that called for the imposition of a no-fly zone over a fellow Arab country, an unprecedented action, knowing full well that the enforcement of a no-fly zone would begin with lethal attacks on the Libyan air defense system. It was almost what some would call a cry for American leadership. Here was the opportunity to protect Libyan civilians, and hopefully achieve another American policy goal, the removal of Mu'amar al-Qadhafi from power, all with Arab League support. Yet the President chose to deliberately downplay the contribution of American armed forces, couching it in terms of "unique capabilities" and support. The reality of the initial coalition, and the reality of NATO* that is now in charge of the operation, is that without the United States military, it does not function. Without the American contribution, there would have been only an ineffectual operation. In addition to massive firepower delivered by American aircraft and missiles, the percentage of aerial refueling, airborne command and control, reconnaissance, intelligence and surveillance was overwhelmingly American. If the intent of downplaying the American role was to convince the Arab nations that this was not another case of the United States trying to interfere in the Middle East, it failed. The Arabs know who is shouldering the load. In this case, we should be claiming that role. It also appeared that the President could not wait to turn command and control of the operation over to NATO, although much of the effort and almost all of the support would still be done by American forces. - Mr. Obama, as you often remind us, you are the President of the United States of America. You are the Commander in Chief of the most powerful military force on the planet. The American people have spent trillions of dollars and invested their most valuable resource, their sons and daughters, to provide you that capability. - To many people, as President, you are the leader of the free world. They look to you for leadership in these types of crisis. It may not be what you had in mind when you decided to run for the office, but we all play the cards we are dealt. You should not abdicate your leadership role. The rest of the world, and in this case, the Arab world, is counting on you. - Get back in the fight. NATO cannot do this with the United States sitting in the sidelines "in case they are needed." They are needed. One only need look at the setbacks handed to the Libyan opposition since you decided to sit it out. Only the American armed forces have the specialized and advanced weapons systems to get this done. - You are the President, you are the Commander in Chief. Act like it. * NATO is the acronym for the North Atlantic Treaty Organization, not as those of us unfortunate as having had to deal with them referred to them - Not After Two O'clock.